I’m guessing you feel like you have too much to do right now. Like, way too much. Especially for entrepreneurs, in a hyperconnected, on-demand world, this feeling has become the status quo for so many of us. It’s overwhelming to get your business started, much less get it to the level that allows you to leave your job. Then once you’re in it, it gets difficult to focus on strategic growth when you’re juggling marketing, sales calls, client questions, social media comments flooding in, not to mention the monthly financials. Meanwhile, everything around us compels us to react faster and faster. But with that comes a cost, especially in business. Running a startup, you’re going to find yourself fighting fires every day, and if you’re not careful, you’ll get trapped. That’s why successful entrepreneurs don’t go searching for gold, they go searching for time. But they don’t just cram in more work whenever they can, or obsess over juggling priorities, as the common wisdom in productivity dictates. Rather, the best of us learn to approach time productivity for entrepreneurs differently in the first place. This is a huge revelation I came to when I first read Rory Vaden’s book Procrastinate on Purpose: 5 Permissions to Multiply Your Time—successful entrepreneurs don’t just do what’s critical or urgent. Instead they focus their time and energy on tasks today that will create more time for them in the future. For example, what if you could spend an extra 2.5 hours on a task today, and save yourself 5 minutes every day, forever. Assuming you only work 250 days a year, that adds up to 21 hours of time in just one year. Not bad, right? Embrace this approach to productivity, and you won’t just get more things done today. You’ll unlock a wealth of additional time tomorrow. There’s a lot of buzz about productivity for entrepreneurs right now, including sooooo many productivity hack listicles (like one of my favorites here on Foundr) and apps. There’s a lot of great advice out there, for sure, but it’s also easy to get caught up trying only to maximize our time. The problem is, this has given rise to this hustle culture, where we’re fixated on becoming what I call either a Crammer (someone trying to squeeze more things into their time) or a Juggler (someone spending more time changing up their to-do list than actual doing). In this hustle culture, humans are involved in an increasing number of tasks. Over time, these build up, with each generation taking on more and more. Under the pressure of this growing list, we become increasingly focused on efficiency, trying to get back on schedule. We’re always looking for better tools and better shortcuts, using our ingenuity to fine-tune everything we do, all in the name of getting things done faster. Think about it, what used to take you two hours you’ve now whittled down to one hour. With your good intentions, you think you’ll now have an extra hour in your day to do what you want to do. But there is a limitation to this strategy. The problem is, the amount of busy work will always expand to fill the amount of time we make available. This is sometimes called Parkinson’s Law, and the concept was popularized in Tim Ferriss’s productivity classic The 4-Hour Workweek. This means there is always more to do, all the time. For example, back when I was working at a global accounting firm, I used to handle multiple audit projects at once. Some had three-week deadlines and others just three days. What I noticed was the same amount of work was being produced in either case. Obviously, the intensity and level of hustle required was different, but the result was more or less the same. At first, I thought it was just me. But when I started to manage my own team, they were used to producing one week of social media content per week. When I asked them to get us a week ahead of schedule, they managed to do two weeks worth of content in just one week. Now, you could say they were probably slacking off a little, but the outcome is still the same however you look at it. The amount of work will expand to fit the amount of available time. So in essence, no matter how much more efficient you become, you’ll always find ways to cram more into it. That could mean cramming in more work or more things to do. I used to do this sooooo often and, eventually, it feels like you’ve crammed way too much in. Kind of like eating that dessert after a huge dinner, even when you know you don’t have room for it. This was the first problem I ran into that led me to feel overwhelmed in my own quest for productivity. I was swamped with so many things to do in my little side business (at the time), that I started to feel burned out. It was at that point in my life when I was introduced to Stephen Covey’s The 7 Habits of Highly Effective People. He brought to my awareness the concept of smart prioritization. By becoming focused on prioritizing tasks, you’d have to weigh up the task against two key metrics: importance and urgency. How much impact would doing this task mean to you/your business? What could happen to you/your business if you don’t do this? Then there’s urgency, which is all about how soon the task must be done. Can the task wait or must it be done right away? How soon does this task need to be done? How long can this task wait? What will happen if it isn’t done soon? By measuring any task by importance and urgency, you’re able to prioritize which tasks need your attention first. 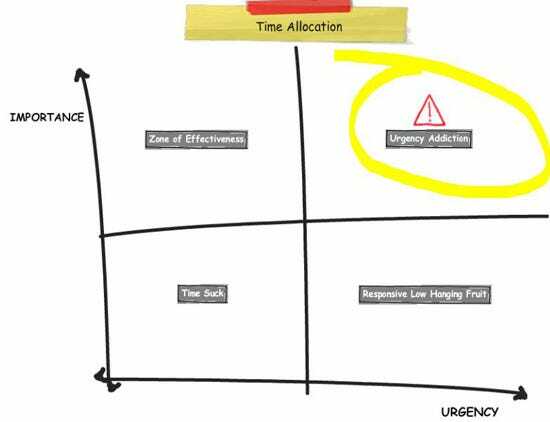 To be most effective, you want to be working in the important, but not urgent zone. The area you don’t want to be trapped in is doing all the tasks that are both very important AND very urgent. That’s when you get stuck. Fire after fire keeps coming up, and you never get the other more important strategic tasks done, because you’re caught up in the urgent tasks that pull you away. We call that the “noise and pressure” in business. Covey’s advice is touted often, and it’s solid, to an extent. But the real issue here is that there is a limitation to how much prioritizing you can do. What I realized is that we all end up being great at juggling the priorities, but we never actually get more done! Prioritizing does not create more time. It just puts one thing ahead of another. You end up spending more time organizing your to-do list than you do actually performing the tasks that need to get done! What you’ve become is one amazing Juggler. You’re doing everything you can to keep everything afloat in your business, all struggling to get the most important and really urgent tasks out of the way. The thing is, basing what you do on just importance and urgency is never going to get you completely out of firefighting mode. To get yourself out of being trapped in your business, and shift to truly working on your business, you need to add a third piece into the equation. To truly know what you should be spending your time on, you’re going to have to look at your workload, not as the Crammer or the Juggler, but as the Multiplier. As Rory Vaden explains, the Multiplier is looking beyond what needs to be done today and focusing on how to multiply their time in the future. A Multiplier subscribes to the simple belief that what not to do is as important as deciding what to do.” So to determine what they should do (and shouldn’t do), they look at both urgency and importance, as our good friend Stephen Covey would endorse. But they also consider the significance. Significance is all about understanding how long it matters that you do this task. It’s about noticing how often you’ll be executing this task, and realizing how much time you’ll have to spend on it every time you do it. How long does it take to do the task? How frequently will you have to do this task? What is the potential here to do something else later on? Will doing this task allow me to save more time in the future? The one thing Multipliers are obsessed with is ROTI. Not that kind of roti. The Return on Time Investment kind of ROTI. This is about the amount of time you spend doing something and the amount of time it creates or saves for you in the future. For example, how much time does it take to set up a calendar appointment system, compared to having to constantly ping back and forth times and dates for appointments with clients? When you start to become a Multiplier, you become focused not only on how you can do more, but how to do more and have more time in the future. For most people, the first way they think to increase ROTI is to just hire someone else to do it. The problem is, if you hire before having the right systems, processes, and structures in place, adding another person into the mix is going to cause a lot more inefficiencies. You’re going to be focused on trying to create an efficient process, all while juggling the human needs of your new employee who is clueless as to where they fit in, and what their purpose is on your team. This is why setting up the right training systems and on-boarding processes is pivotal for any business looking to step out of startup mode and into scaling. The thing is, training someone to completely take over a task from you often takes up a lot of time and energy (not to mention patience). In Rory Vaden’s Procrastinate on Purpose: 5 Permissions to Multiply Your Time, he talks about how Multipliers use the 30x Rule. The 30x Rule goes like this. You should spend 30 times the amount of time it would take you to do a task when training someone else to do it. So if it takes you five minutes, it’ll cost you 150 minutes (2.5 hours) to train someone to fully take it over. But here is the kicker. Most people stop here, because they think the cost is too high. As Vaden puts it, “They are all caught up in this urgency mindset.” We’ve been brought up to be the Juggler, focusing on the urgency of today over the significance of tomorrow. In one year, doing the task yourself would take 5 x 250 working days = 1,250 minutes. Now compare that to the 5 x 30 = 150 minutes of your time (today) to train someone else in how to do it. This leaves you with a ROTI of 1,150 mins (1,250 – 150), allowing you more time to do more of the things that matter to you and your business. The biggest barrier stopping you from being able to focus on becoming a Multiplier is the belief that the urgent tasks need to be done first, over those that are going to make a significant difference in your life and business. This is why you need to take the first step and allow yourself the time, energy, and space to focus on doing things today that will give you more time tomorrow. So how do you figure out what you should focus on? As they say, knowledge is great, but it’s useless without accompanying action. The next stage of becoming the Multiplier is all about funneling down what’s happening around you, investing time now to save time later, and then concentrating only on the things that need your personal concentration. That’s where the focus funnel comes in handy (courtesy of Rory Vaden himself). Here’s how to use it. The focus funnel is your path to finding out what tasks you should do to create more time in the future. As we all should know by now, there is no such thing as multitasking, so you can’t do it all. In order to figure out what comes out of the focus funnel, you have to first figure out what goes in it. The best way to do this is to first write down a list of all the tasks you’re currently performing in your business, either on paper or in a document. You’ll probably miss a few tasks. So if you can, I highly suggest you capture as many as possible with a time study of yourself for one week. Basically, you record every half hour of your day and note what tasks you are doing in those times. After one week, you should have a good idea of where your time is going. Then you can review it to identify what tasks you might have missed on your list. Here is an example of my own time study, and feel free to grab your own copy so you can perform your own. Once you’ve nailed down your list you’re ready to dump it all into the focus funnel, which kind of looks like this. All of these tasks I tag with an E to know that they can be eliminated. Once you’ve eliminated all that you can, you’re going to start thinking like a Multiplier, identifying things by their significance to decide if you can invest time now, so as to save time later. First up, you search for tasks that can be automated. Not much to explain here, as it’s basically having a machine or computer program execute your task. If a task can be automated, tag it with an A and know that you’ll have to invest the time and effort to create or find the program that can do it for you. As ideal as it would be automate everything in our businesses, it does come at a monetary expense (sometimes a little too large when you’re starting out). So there needs to be a balancing act, and that’s why the next step of the focus funnel is delegation. Again, you’re going to use your Multiplier lens to pluck tasks that are worth investing time into today to create more time tomorrow. For those that may have automated solutions, but are out of your budget range, you’re going to have to consider delegating the task to another person. With the internet creating a global marketplace, it’s now easier to outsource your tasks to someone in another country with a cost of living that allows them to do the task at a lower rate than you could. At this layer of the funnel, you should be asking the question, “Can someone else be trained to do this task for me?” The key here is not a measure of whether they can do it better than you or right now, but is it possible. If so, it can be tagged with a D.
This will drive you to understand whether it is something so urgent and critical that no one else can do it, in which case it falls on you to do it. Or you realize the task can wait, so you throw it back up to the top of the funnel until one of the four layers of the funnel can be used to start working on the task. This is what Rory Vaden defines as procrastinating on purpose: knowing full well that you choose to wait, rather than haphazardly putting off the task. If you focus on being a Multiplier and doing the focus funnel exercise, you’ll be able to figure out the tasks you should be concentrating on, automating, or delegating so they’ll create more time in your future. This is how you find, what I call, all the noise, pressure, and procrastination in your life and business. The moment you start to identify what they are, it’s only then you can consider hiring and building virtual teams, or implementing automated systems to take the load off you as the business owner. Giving you back your time to do more of what you love, be it in your business or to enjoy the finer things in life. What task is currently causing you the most noise, pressure and stress in your business? Leave a comment below.